MIAMI, May 4, 2016 /3BL Media/ The UPS Foundation, the philanthropic arm of UPS (NYSE: UPS), today announced an initial cash and in-kind commitment of more than USD $500,000 to aid in response and recovery efforts following the destructive earthquake that struck Ecuador on April 16. The UPS Foundation contributions will enable the provision of urgent relief, as well as on-the-ground logistics support via the United Nations Logistics Cluster’s Logistics Emergency Teams (LET). Through its Humanitarian Relief & Resilience Program, The UPS Foundation has already contributed a significant portion of these funds toward the immediate activation of emergency funds, enabling the purchase and distribution of critical relief supplies in Ecuador. These funds were provided to the United Nations High Commissioner for Refugees (UNHCR), where UPS was one of the agency’s first partners to respond and commit funding to UNHCR’s disaster relief efforts, which included the purchase of temporary shelter items to protect earthquake survivors during the rainy season. Additionally, emergency funding was also given to the World Food Programme (WFP) to help procure perishable foods for emergency kits that are being delivered to impacted communities. These emergency food assistance kits contain products such as milk, quinoa, flour and tuna, which can provide enough food to feed over 8,000 people in the country’s worst-hit areas. Funding was also activated for CARE to assist with water, sanitation and hygiene (WASH) relief. Given the widespread infrastructure damage, affected families will need clean drinking water and adequate sanitation facilities that WASH products will help provide. Beyond providing monetary assistance, UPS is also using its global logistics network to give in-kind support toward relief efforts in Ecuador. The company is further helping UNHCR by coordinating a flight to Guayaquil, Ecuador, to deliver 100 metric tons of relief provisions such as sleeping mats, tents and lanterns. 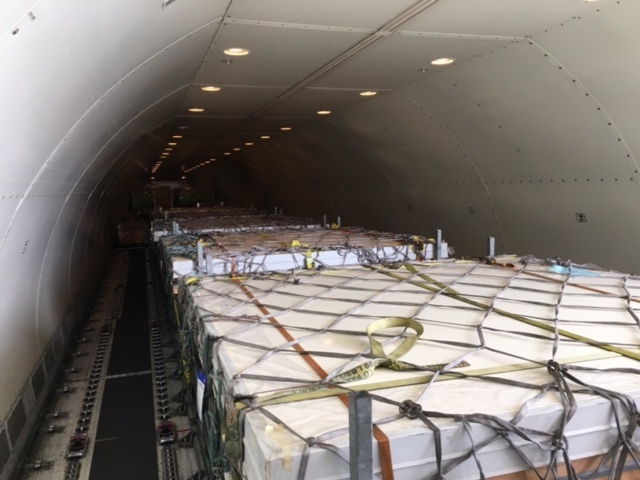 UPS also flew two additional 767 relief flights from Panama to Ecuador for WFP, carrying 73 metric tons of cargo including generators, lighting equipment and portable warehousing materials. Furthermore, UPS will aid MedShare, by transporting 11 pallets of donated medical supplies, which will be distributed to multiple medical centers treating earthquake victims. The UPS Foundation is also partnering with the U.S. Ecuadorian Embassy to provide logistics expertise. 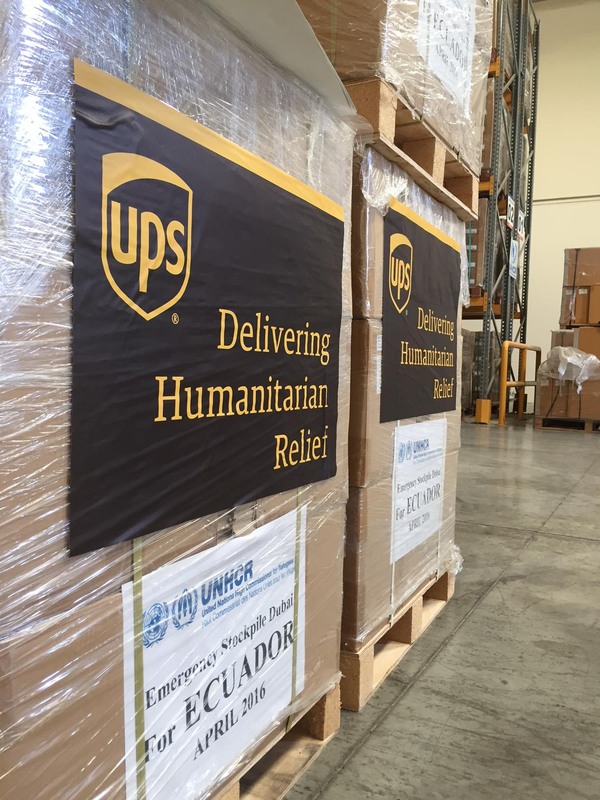 As part of the company’s on-the-ground efforts, The UPS Foundation has assembled a team of logistics experts to work closely with the United Nations Logistics Cluster and the WFP to assist with warehouse logistics and transportation near Quito. Additionally, The UPS Foundation is collaborating with the United Nations International Children's Emergency Fund (UNICEF) to coordinate ground logistics to provide onsite relief support from Quito to areas affected by the earthquake. The UPS Foundation’s Humanitarian Relief and Resilience program provides communities with crisis recovery support, from disaster preparation to urgent relief following an event through post-crisis rehabilitation. In 2016, The UPS Foundation committed $14 million in funding, technical and in-kind services to support a broad range of disaster resilience initiatives to strengthen preparedness, response and post-crisis recovery. 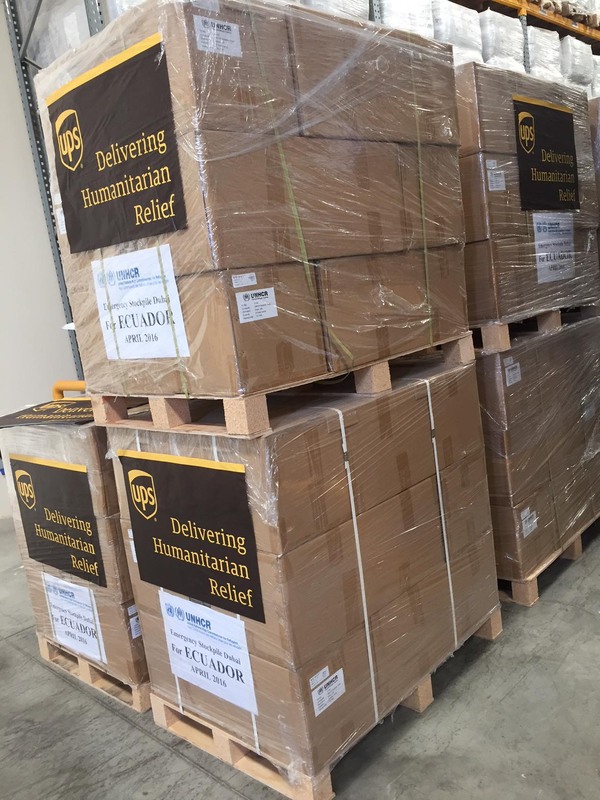 In 2015, The UPS Foundation assisted with more than 350 shipments to 50 different countries to help with disaster response and recovery efforts.